If that's too much to read, then here's the gist. A customer, Dave, who pre-ordered a gaming peripheral and didn't receive it at the promised date decided to contact the PR agency to determine what was going on, get some revised info -- the usual thing you would do when a shipping snafu occurs. He asked this on 16th December. The response he got, from Ocean Marketing PR rep Paul Christoforo, was "dec 17". So he followed up, seeking clarity, and what he got in return was insults and bullying (in poor English). What follows is a rather long email chain (which comprises the bulk of the above links). Finally, Dave decided to include a number of publications into the chain, and Mike Krahulik, better known to the internet as Gabe on Penny Arcade, took notice. It seems that he wasn't originally going to intervene too heavily, but Christoforo bragged about the various trade shows he would be representing his product, things like CES, and one PAX East. Obviously, that got Krahulik's attention, and he made the decision that if Ocean Marketing did have a display at PAX East, then it would be cancelled. I think there is a big difference between being sorry and being sorry you got caught. Ultimately, Christoforo is now in a difficult position, and the developers of the gaming peripheral have expressed remorse in choosing him as their PR guy. It's hard to feel sorry for him, though. Throughout the entire communication, he was given enough rope to hang himself with, and he gladly tied the noose and stepped into it. Sorry to editorialise there, but it does amaze me that Dave and Gabe can carry themselves with an air of professionalism, whilst Christoforo is so assured with himself that it justifies his behaviour. It's probably wrong to pass moral judgement as to whether publishing the email chain was right or wrong, but it's difficult to sympathise with Christoforo, and it's always warming to see somewhat reap what they sow. he is trying to call it off as getting caught on a bad day which is BS since this went on for many different days. I think he well got what he deserved and his attitude towards this all shows he is only sorry for getting caught and has learned nothing. Was this "Gabe" referring to the founder of Valve perhaps? 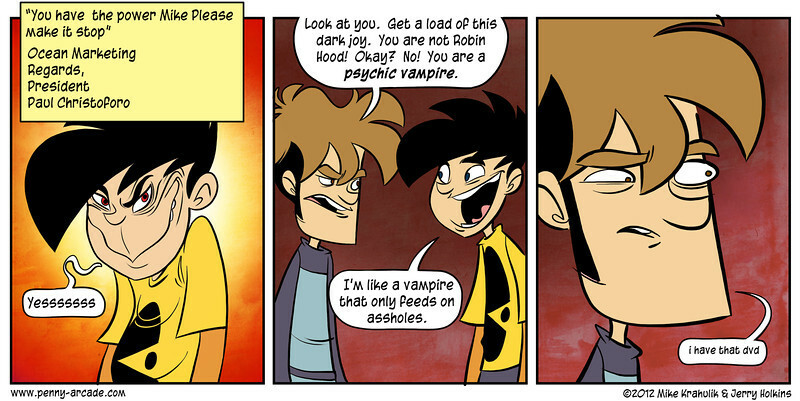 Gabe is the online nickname of Mike Krahulik. Or, "online moniker" since that sounds much more awesome. I saw the video was made less than 24 hours after the story broke, satire is rather fast in the internet age It's a rather hilarious situation, one that makes me wonder how someone this inept at their job made it to such a position of power. Its both really funny and really sad. heh, didn't see the video. hilarious! Amazing video!!! LOL. I read the Penny-arcade bit when it first hit and KNEW this was the next Meme. This guy is a gift that just keeps on giving. Poor guy is never going to have a decent job again.